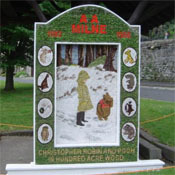 Well dressing is a custom practiced in rural England in which wells are decorated with designs created from flower petals. The custom is most closely associated with the Peak District. The origins of the tradition are alternatively said to lie in pagan tradition or in giving thanks for the purity of the water drawn from certain wells during the period of the Black Death. It is often said to have originated in Tissington, Derbyshire, though other claims can be made for Eyam and Stoney Middleton. What ever its origins it was historically a custom exclusive in England to the Peak District of Derbyshire. The custom almost died out by the early years of the 20th century but it was revived in the 1920s and 1930s largely through the travails of local Headmaster Mr Edwin Shimwell. The custom has since spread outside its traditional heartland to numerous villages and small towns in Derbyshire, Staffordshire, South Yorkshire, Cheshire, and even as far afield as Shropshire.